Visual Lure recently wrapped up a logo design for RX for Print, a product created by a St. Louis area software developer. We were originally contracted to simply convert a typography based logo from Microsoft Word into vector artwork (and other electronic formats), but we ended up redesigning the entire logo. The software tracks company’s/organization’s printers in order to conserve on printing cost and to track waste. 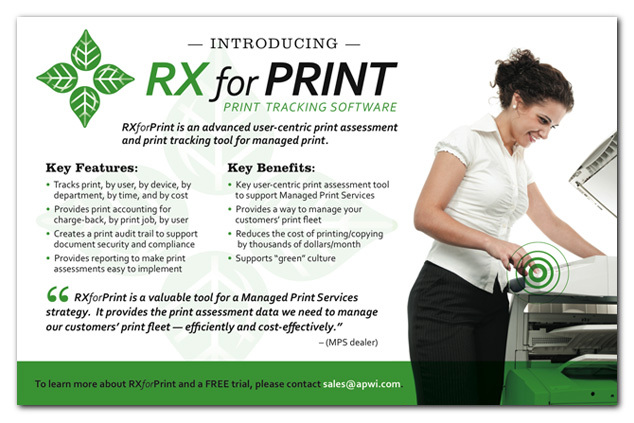 RX for Print really wanted to show that their software was “green”, so we came up with the logo design below. It features four droplets of ink that also create leaves. The droplets of ink of course represent printing and the leaves represent the “green” aspect of their software.